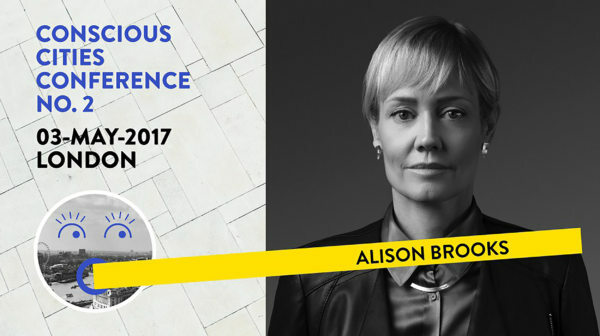 Alison Brooks will be speaking on the subject of conscious design and behavioural insight at the Conscious Cities Conference No. 2: Bridging Neuroscience, Architecture and Technology, a full day event taking place in London’s Urban Innovation Centre. Building upon the topics and findings from its first conference examining the relationship between neuroscience and architecture, Conscious Cities’ second conference will disseminate and unify the industries and elements needed to create and build a ‘Conscious City’ that is responsive to human activity and needs. What Does Neuroscience Teach Us About The Built Environment? How Can We Use High Technology In The Built Environment? Creating Conscious Design: How Does Behavioural Insight Affect Architecture And Planning? What Do We Want Life To Look Like In A Conscious City? Ethics In The Built Environment. 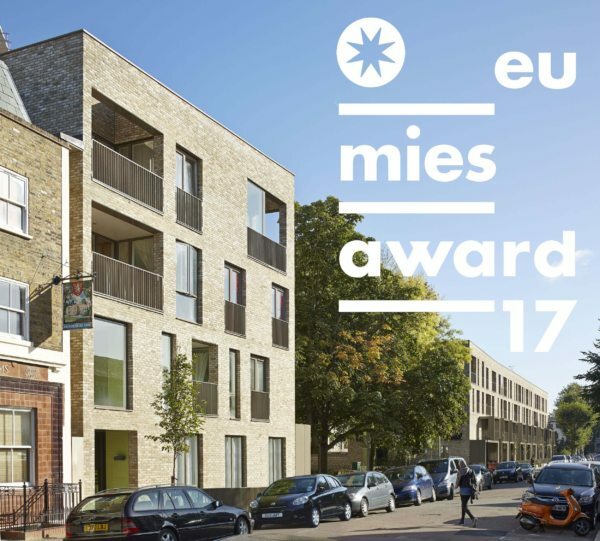 Alison’s talk will focus on the transformative social and psychological role that architecture can play, using ABA’s EU Mies Award 2017 finalist Ely Court as an example. For more information on the event and to book tickets, click here. Alison Brooks and project architect Nelson Carvalho will present EU Mies van der Rohe Award Finalist Ely Court as part of a public lecture series featuring the five finalists in four cities over three days. Alison and Nelson will speak on the 1st May at the Academie van Bouwkunst of Amsterdam. For more information on the event, click here. Following the lecture series, the jury will visit the finalist works and will collect first-hand information from the people who use the buildings, the clients and the architects to aid in their judgement process. Following deliberations, The Prize Winner and the Emerging Architect Winner will be announced in Brussels on 16th May. The process will culminate with the Awards Ceremony on 26th May at the Mies van der Rohe Pavilion, marking several days of Open Doors throughout Europe during which sites of the shortlisted works will be open for visits by the general public. The European Union Prize for Contemporary Architecture Mies van der Rohe Award is awarded biennially to works completed within the previous two years. The principal objectives are to achieve a thorough understanding of the transformation of Europe’s built environment; to recognize and commend excellence and innovation in the field of architecture and to draw attention to the important contribution of European professionals in the development of new ideas, the clients who support them and the citizens that enjoy them. Alison Brooks will open Toronto:London, NLA’s International Dialogue event examining and comparing the growth of the two global cities. This international event, being held simultaneously in both Toronto and London, will bring together experts from both cities for an exchange of ideas and approaches and discovering how both cities can learn from each other. Alison will focus on key the opportunities for civic, cultural and economic value offered by waterside regeneration and will describe the ways London can learn from Toronto. She will join a panel discussion at the end of the session. Toronto:London is a New London Architecture member-only event. For more information click here. A Winning Smile! We’ve won the Jury’s Award for the Cultural-Pavilions category in the Architizer A+Awards 2017, announced 11th April. The Smile was also shortlisted in the Pop-Ups, Temporary and Wood categories. The highlight of the 2016 London Design Festival, The Smile was an experimental public pavilion designed by Alison Brooks Architects and engineered by Arup. Conceived as a habitable arc poised on the horizon, The Smile offered an immersive sensory environment integrating structure, surface, space and light. 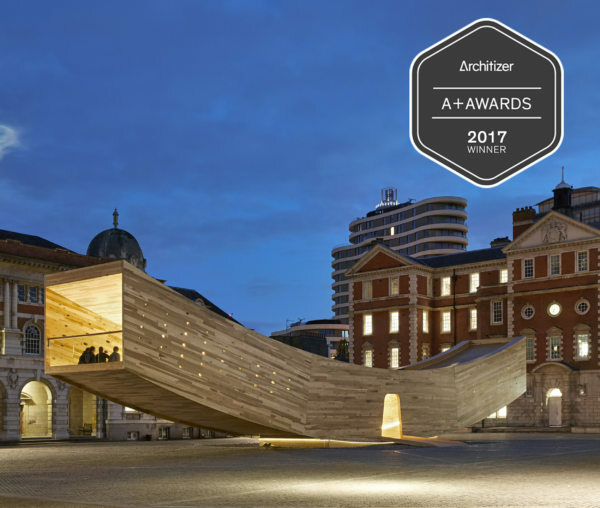 Using only cross laminated timber, the 34-metre-long dynamically curved space was an installed in the Chelsea College of Art (UAL) Parade Ground opposite Tate Britain. It was open to the public for 4 weeks attracting 30,000 visitors. With 290m online views and thousands of Instagram photos, the Smile sparked a global audience with its spectacular scale, pure form, and advanced timber engineering. Each end of the Smile focused on a particular view of the locality – at one end a tree crown, at the other end the Edwardian façade of Chelsea College. Small perforations along the length of the tube expressed the forces acting on the CLT, translating the forces into light patterns for the Smile’s interior. Unique to tulipwood as a structural material is its beautiful grain and fine finish. Along with its unique curved floor, natural timber scent and unusual acoustic qualities, the Smile was ‘the most complex structure ever built in CLT’. The project brief was to create a magnet for public engagement with architecture and design, while demonstrating the extraordinary properties of tulipwood, a North American hardwood tree species that is twice as strong and half as heavy as softwood. The Smile’s 12m long x 4m wide x 3m high CLT cantilevers were engineered to support 60-100 people at one end with only a 1m deep timber footing. The Smile one of the most important developments in a decade of research into structural timber innovation by The American Hardwood Council and Arup. The Architizer A+Awards is the largest awards program focused on promoting and celebrating the year’s best architecture and products. Its mission is to nurture the appreciation of meaningful architecture in the world and champion its potential for a positive impact on everyday life. The shortlist of five finalists per category was nominated by an international jury of industry leaders from architecture, technology, art, fashion and design fields. The awards culminate in a red carpet gala celebration in New York in May.